Imagine you had a pair of glasses that had a sustainability mode. This mode meant that you looked at the world through a “sustainable lens”. What would you see? These lenses wouldn’t merely be green tinted glasses like the ones from the Emerald City in the Wizard of Oz. Instead, think about the analytical eyes of the Predators (robots) in the Terminator movies. These eyes scan the landscape, identifying threats, analysing options and proposing actions. Each week Shane Gallagher and Samuel Mann take a sustainable perspective on current topics in the world around us. Regular features aimed at drawing out connections lead into an extended discussion with invited guests. 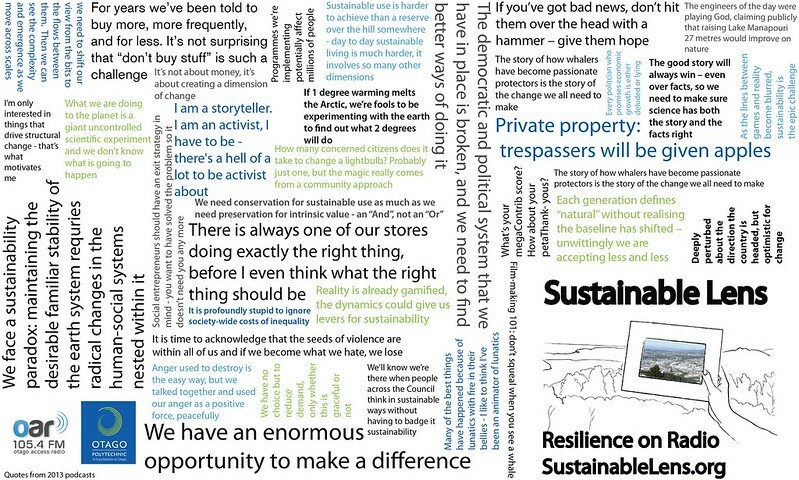 We are building up a searchable archive of conversations with people from many different fields who are applying their skills to a sustainable future. In our conversations we try to find out what motivates them and what it means to see the world through a sustainable perspective, through their sustainable lens. Podcast and live on Otago Access Radio (Thursday NZ 7-8pm 105.4FM/1575AM in Dunedin). Make an appointment for joined up thinking. We’re on facebook, and flickr, and iTunes.